GANATSEKWYAGON, ON. MONDAY, JANUARY 29, 2018. 5 PM ET. [UPDATED JAN 30]. It may still be, as some wise observers have suggested, that the Ontario Progressive Conservatives — now disentangled from the wobbly leadership of Patrick Brown — will go on to handily win a majority government in the June 7 provincial election. At the same time, contemplating what has happened this past weekend to the political organization that once ruled Ontario for 42 uninterrupted years (1943–1985), it is also possible to envision various quite different scenarios. Former Ontario PC party president Rick Dykstra, back when he was federal MP for the St. Catharines area. 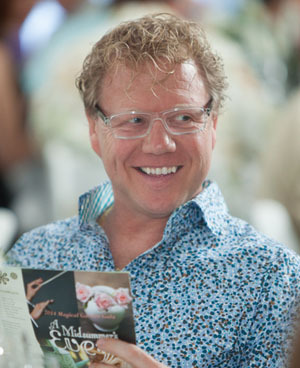 The trouble deepened profoundly when party president Rick Dykstra “resigned suddenly Sunday evening” over similar allegations of improper behaviour, about to be published by Maclean’s. 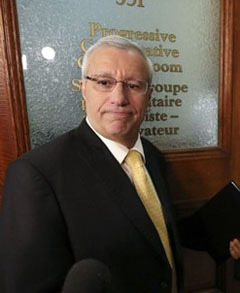 Vic Fedeli was “shocked and disgusted’ to learn about the allegations against Rick Dykstra. Photo : Richard Lautens, Toronto Star. One formerly resigning staffer is Nicholas Bergamini, who “has returned as the new director of communications.” The other is Brown’s former and Fedeli’s new Chief of Staff Alykhan Velshi. 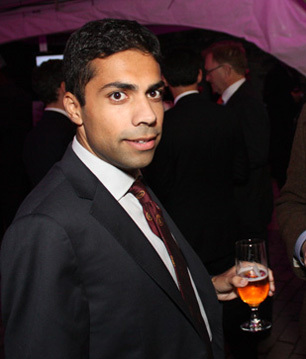 Alykhan Velshi, at a more relaxed moment in Ottawa. One thing all this turmoil might do over the next while is bring some of the important PC staff people into clearer focus for we mere voters, who only know what we read in the papers (or see on TV or hear on the radio or come across on one or another branch of the new “social media”). Fairly or otherwise, for instance, the Wikpiedia article on Alykhan Velshi paints a picture of a? more right-wing conservative ideologue than someone who would be seriously comfortable with the ostensible centre-left leanings of Patrick Brown’s “People’s Guarantee” platform. 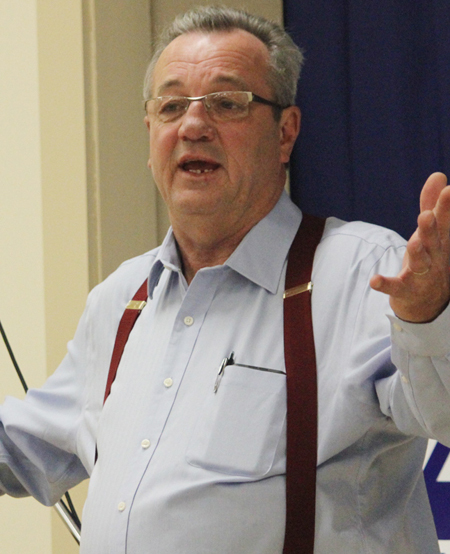 The current clash between right-wing Ontario PC MPP Randy Hillier and “Goldie Ghamari, now the PC candidate for the riding of Carleton” similarly draws attention to the ancient PC internal conflict between progressive Red Tories and conservative Common Sense Revolutionaries. 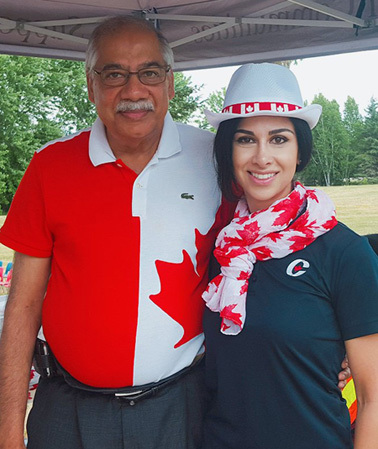 Goldie Ghamari (r) with Stittsville Councillor Shad Qadri, Canada Day 2016. Someone better decide soon just what it is the Ontario PC s are really going to do for a leader, now that they have so cleverly divested themselves of Patrick Brown. As yet, at any rate, it is still not exactly written on the wind that they are going to win on June 7 big time. 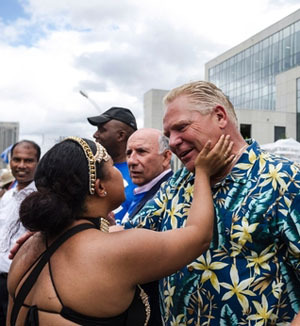 It is now more than three decades since Frank Miller let the old PC dynasty slip from his hands and into the long-waiting arms of the David Peterson-Bob Rae Liberal-NDP Accord of 1985–1987. And the Mike Harris-Ernie Eves aggressively right-wing Conservative governments of 1995–2003 are still not remembered fondly by many Ontario voters.